Where else can you try wines from nearly 30 Central Coast wineries, enjoy specially paired small plates from almost two dozen of the top SLO restaurants and caterers, learn about winemaking from two masters, and experience a delightful evening at the historic Mission in downtown San Luis Obispo? “Corbett Canyon, Canyon, Canyon.” Do you remember that radio spot from the 1990s? 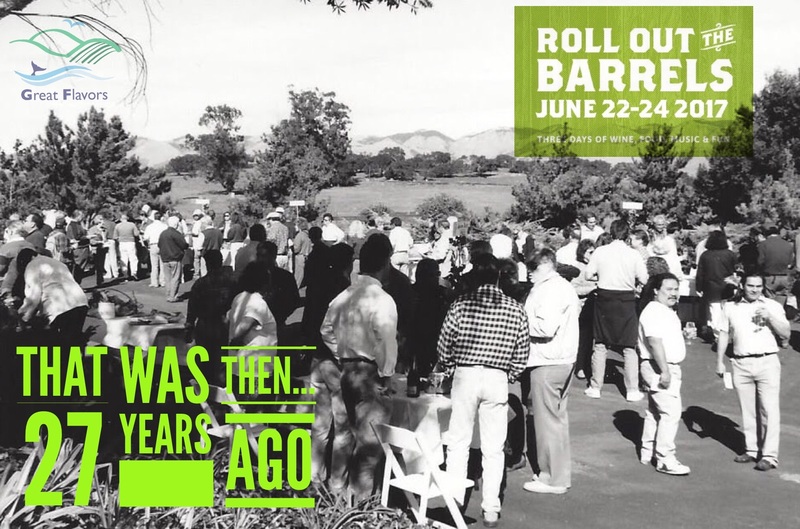 Way back in 1990, the first Roll Out the Barrels event was held in the driveway of Corbett Canyon Winery in the Arroyo Grande valley. 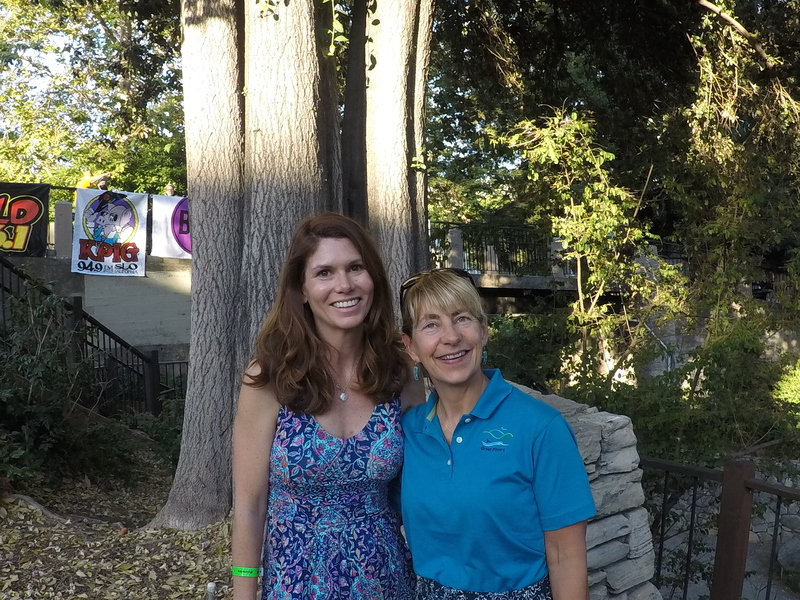 About 100 people—a great turnout for a first-time event—showed up to taste the wines from Corbett Canyon (now Center of Effort) and the small handful of other wineries who were early members of the fledgling SLO Wine Country Association. Fast-forward 27 years to the 2017 edition of Roll Out the Barrels, held June 22-24. The first event of Roll Out the Barrels is held Thursday afternoon, June 22. Named Barrels in the Plaza, it’s been building on the original gathering held at Corbett Canyon. 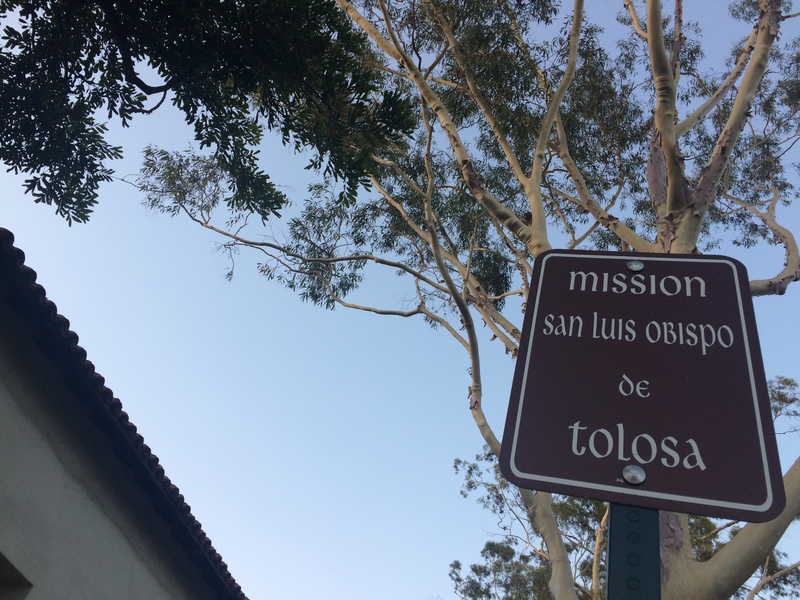 What will this year’s attendees, numbering about 500 strong, find nestled under the shade trees and along the broad patios of the historic Mission San Luis Obispo de Tolosa? Let’s head inside the gates and find out. We’re excited as we wait in line with our fellow wine enthusiasts in the ever-growing crowd outside the mission gates. It’s the Flavor Team’s first Barrels in the Plaza, and we can’t wait to get started. 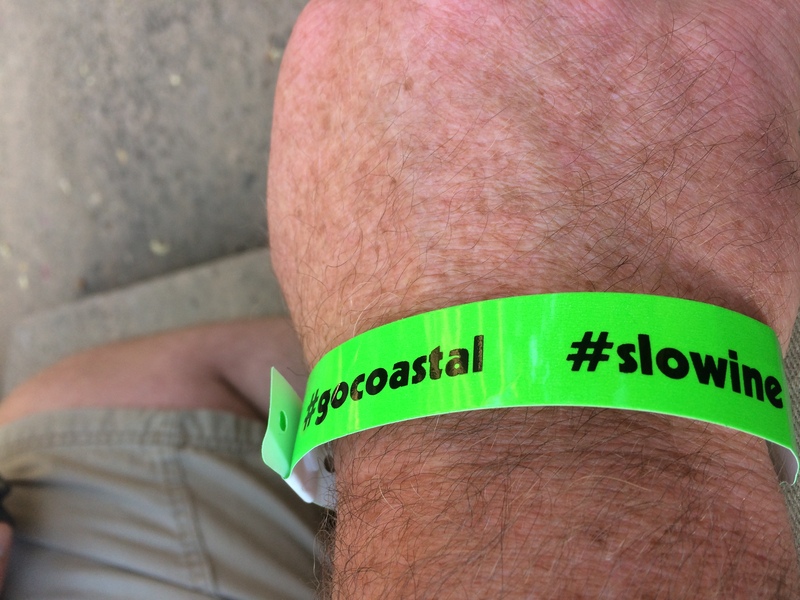 After we get our neon wrist bands and official SLO Wine Country glass (both will be required for the 4×2 Wine Passport events Friday and Saturday), we head through the gate. The magic of Roll Out the Barrels 2017 begins. Right off the main entrance is Chêne Winery and Novo. How interesting Chêne is the first winery we see. Why? Because in a couple days, our California Wine Appreciation Class, taught by Mike Botwin as part of Cal Poly Extended Education, will be visiting Chêne to have a winemaker tour and tasting with owners David and Lisa Platt. 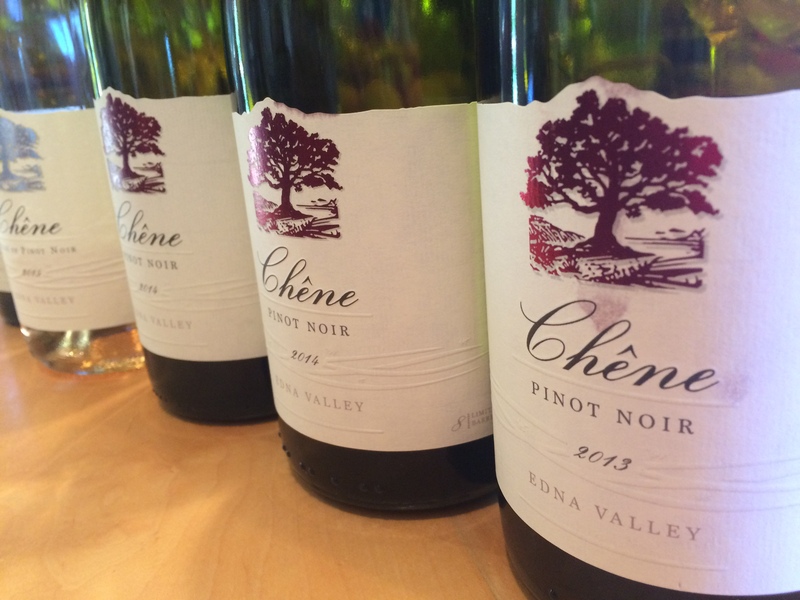 We sample Chêne’s Pinot Noir Rose, Chardonnay, and Pinot Noir. All very good. The Pinot Noir is especially good—big and vibrant from this small handcrafted winery in the Edna Valley. As we sample poke from Novo (exceptional), we take in the scene of Barrels in the Plaza to get the lay of the land. Throughout the courtyard, tables flank both sides of the walkway. Each table pairs a winery and a food purveyor, many of which have teamed up to provide a pairing that matches one of the wines with the food. Further up the patio, stairs descend to the Mission Amphitheater, where two winemakers will give educational talks a little later, and more steps lead to another shaded patio with more wineries and food tables. I’m a little disappointed there aren’t actually “barrels in the plaza”—using barrels as the tables. The name of the event had me expecting lots of retired wine barrels used as the serving areas for wine and food, but I realize this would be less efficient. At least there are barrels scattered through the plaza for use as standup tables. 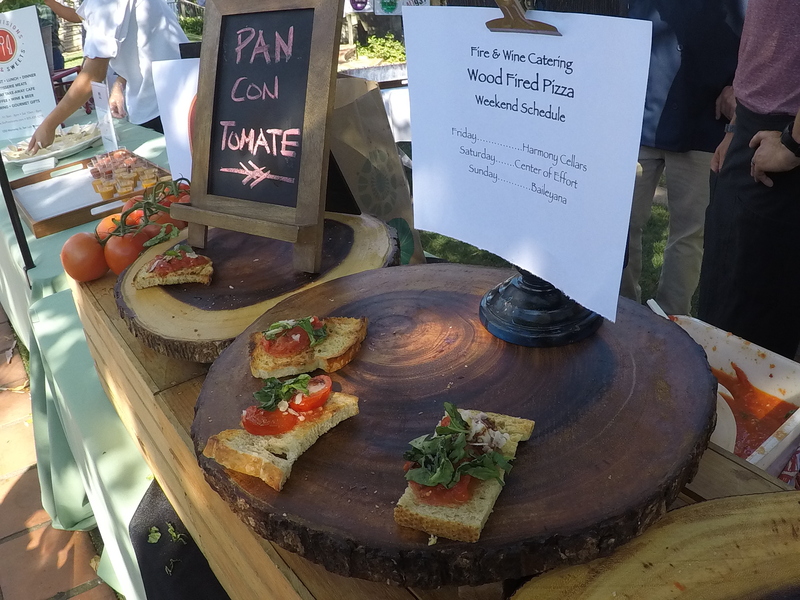 We join the meandering crowd and begin tasting wine from nearly 30 wineries and enjoy specially paired small plates from almost two dozen of the top SLO county restaurants and caterers. 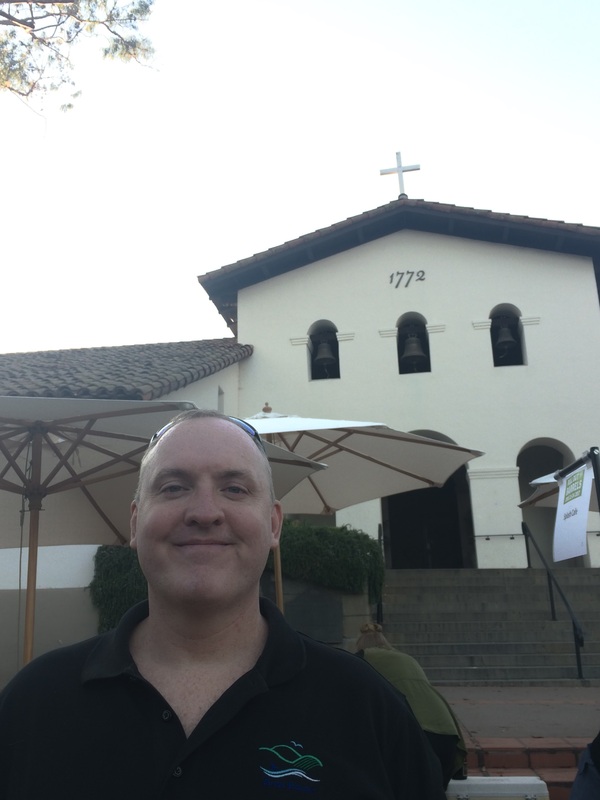 Flavor Team member Andrew in the the shadow of the historic Mission San Luis Obispo de Tolosa. With so many wineries and restaurants in attendance, we know we unfortunately won’t be able to taste at every one. Sad but true. So, we make a point of stopping at some we haven’t yet tried, as well as saying hello to some of our Flavorite wineries. Fromagerie Sophie owner Sophie Boban-Doering with Flavor Team member Kara. With a plate of yummy cheeses from Fromagerie Sophie and a quick conversation with owners Sophie and Paul, we begin our tasting with Center of Effort. This winery has been on our radar since the Edna Valley Collective Dinner at the World of Pinot Noir a few months prior. We try winemaker Nathan Carlson’s 2014 Center of Effort Pinot Noir. Very good, with structure and balance. 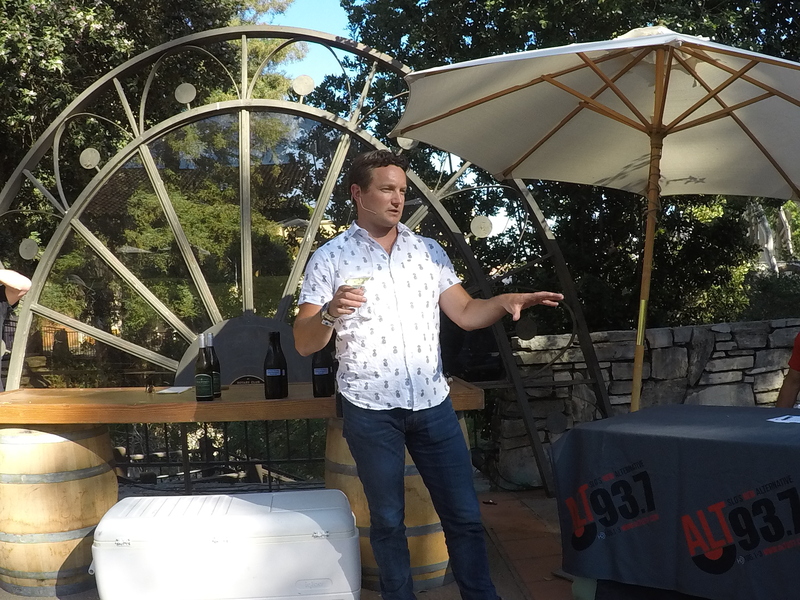 Next, we stop and chat (and taste wines) at Autrey Cellars, and share our appreciation for the science of sound that winemaker and engineer Steve Autrey shared at a recent visit to his winery. Karen Mott with Tolosa pours a wine we didn’t try at our recent Tolosa tour and tasting. At Kynsi, the elusive Hutash is not in the house. They suggest we visit during the 4×2 Passport to see if we can find it. 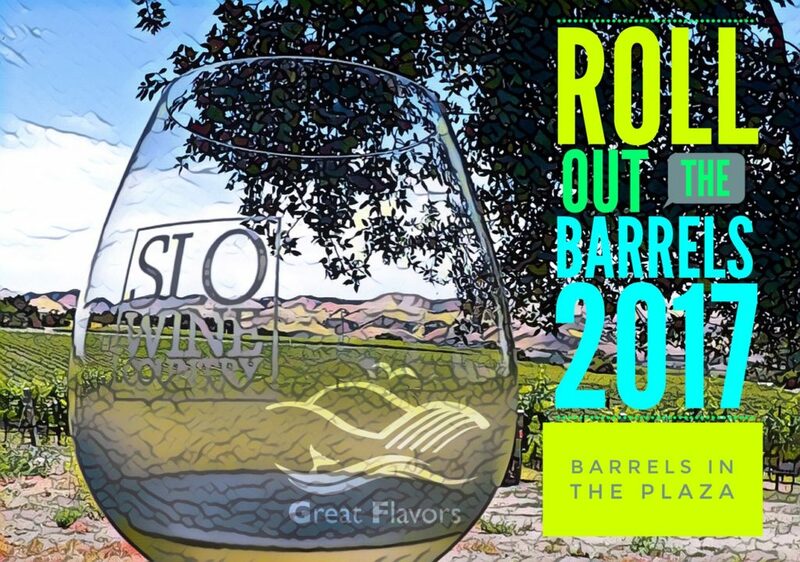 A few days before, we did a phone interview with Heather Muran, Executive Director of SLO Wine Country, for a pre-event story on Roll Out the Barrels 2017. She shared great information and said to be sure to find her here tonight. As the awesome band, Bear Market Riot, takes a short break, a woman walks to the mic. After she finishes, we introduce ourselves. Ms. Muran is as gracious and helpful in person as she was on the phone. Before we know it, it’s time for the first Pop Up Winemaker Seminar: Fintan du Fresne with Chamisal Vineyards, who will share The Chardonnay Spectrum Tasting. Originally from New Zealand, Mr. Fresne has been winemaker with Chamisal since 2006. Winemaker Fintan du Fresne with Chamisal Vineyards discussing the spectrum of Chardonnay. The Edna Valley AVA is the coolest California wine region—the perfect environment for Chardonnay. William, one of the head tasting room experts at Chamisal, helps pour the tastings, which range from stainless steel with no malo, to a blend with neutral French oak kept on the lees as long as possible, to barrel samples from new French oak with medium+ toast. Chardonnay has a natural texture and richness that some other white grapes, like Sauvignon Blanc, do not have. To highlight this, he chooses a light touch with his winemaking. Before the next winemaker seminar at 6:30, we seek out some wineries we haven’t tried. Avila Beach winery Croma Vera and SLO-based Filipponi Ranch Cellars are a couple new wineries we try. We stop by Talley Vineyards and Stephen Ross Wine Cellars to taste their Stone Corral Pinot Noirs. It’s on our list to do a story comparing the Pinot Noirs from the Stone Corral vineyard, where Talley, Stephen Ross, and Kynsi have blocks in the renowned vineyard. 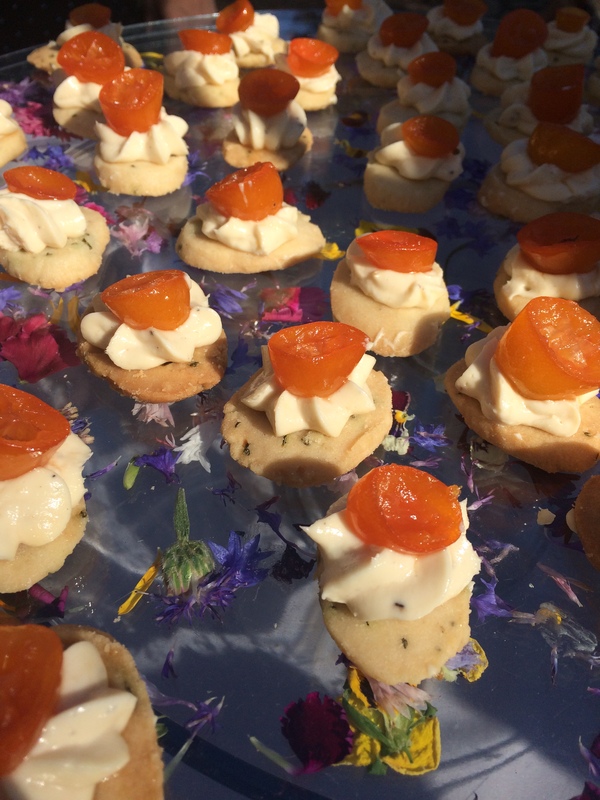 Food from Mint+Craft, Fire & Wine Catering (we get an even bigger taste at the 4×2 Passport event), Cattaneo Brothers, Taste! (and tips to avoid the crowds at this super-popular SLO eatery), and SLO Provisions rounds out the next hour. It’s time for Wolff Vineyards’ winemaker Dr. John-Pierre Wolff to share his expertise of the coastal influence on alternative red grapes of the region, including Syrah, Petite Syrah, and Teroldego. Wolff Vineyards’ winemaker Dr. John-Pierre Wolff shares his expertise of the coastal influence on alternative red grapes. 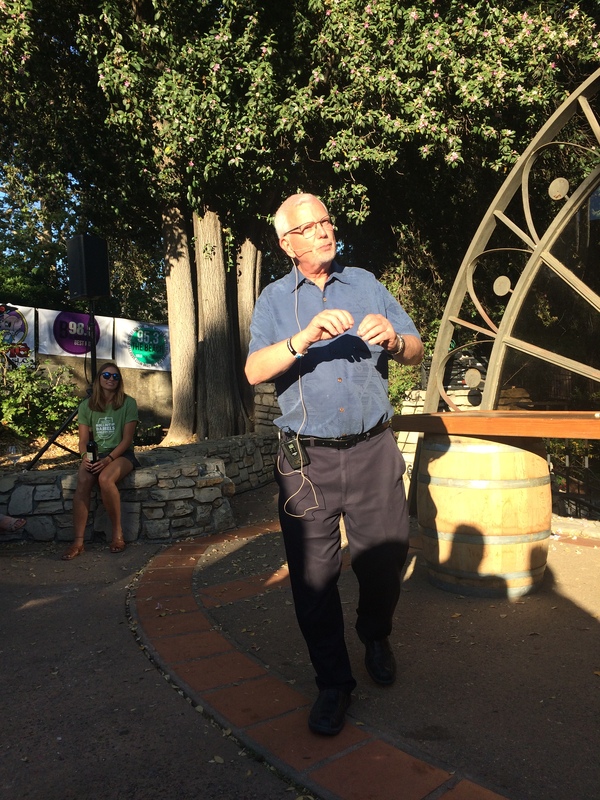 This wine was in American oak, and he explains a bit about the cooperage process. Even with the same medium+ toast on a new barrel, French oak often has a tighter grain and more delicate flavor than American oak, which can be more porous and have bold flavor. And finally, we get to the 2015 Teroldego, a deep red wine. This is one of Kara’s favorite grapes, both the word—the way it rolls off the tongue—and the taste. “Teroldego is a cool-climate grape related to Syrah, and found primarily in the Tyrolean area of northern Italy,” shares Dr. Wolff. We round out the evening at Barrels in the Plaza with two last tastings. Our last stop is Cutruzzola Vineyard in Cambria. 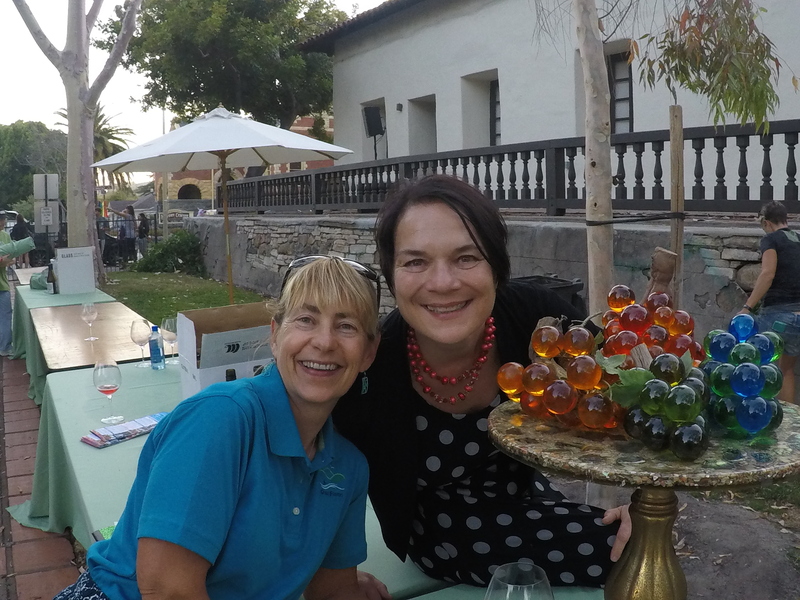 Winemaker and partner Lisa Miller shares their wonderful estate Riesling and Pinot Noir. She mentions they produce their wines with Stephen Dooley of Stephen Ross Wine Cellars in SLO, which is one of our Flavorite wineries and winemakers. (You can read more in our Stephen Ross Winemaker Focus story.) We love the charming town of Cambria, and we look forward to visiting Lisa at Cutruzzola Vineyard soon. As the evening comes to a close, we see Paula and Stephen Dooley and say hello. They really enjoy participating in this event, and this year’s edition of Barrels in the Plaza has been especially good. As if on cue, a gentle but serious event staffer comes up to say the event is closing and we all need to make our way to the exits. With our souvenir wine glasses in hand, we say goodbye to the Dooleys and to our first Barrels in the Plaza experience. 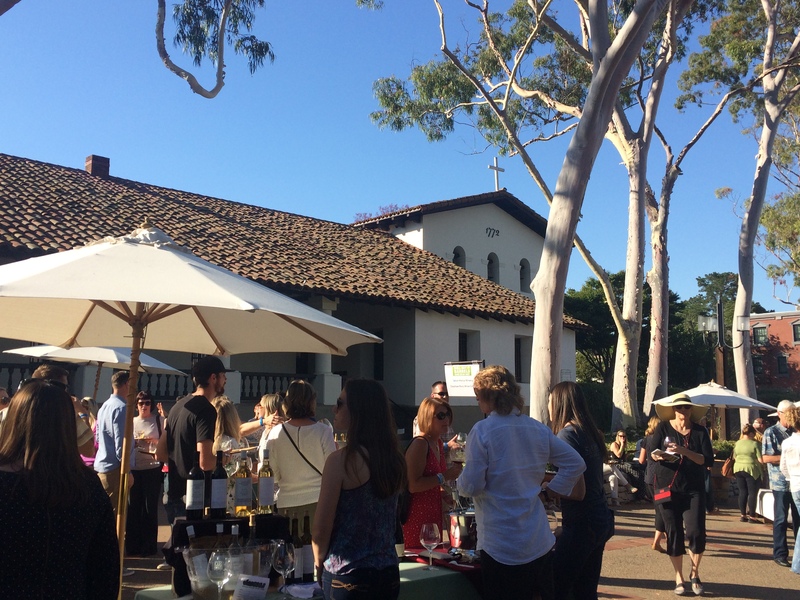 What a great event: the opportunity to try so many quality wines and meet the winemakers, sample food from some of the best restaurants in SLO county, and spend time at the beautiful and iconic Mission San Luis Obispo de Tolosa with people who also enjoy filling life with great flavors. We’re looking forward to next year’s Barrels in the Plaza. 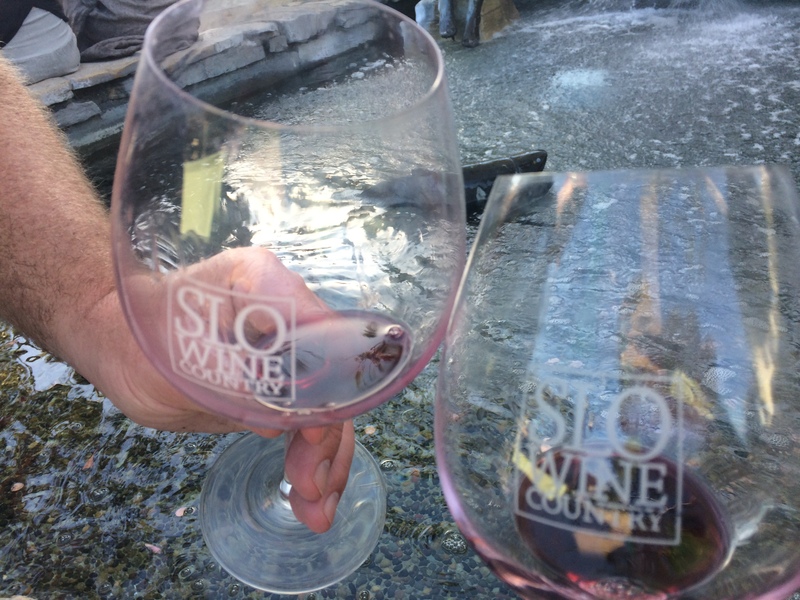 If Heather Muran and the talented team at SLO Wine Country have anything to do with it, we’re pretty darn sure it may be even better. If you enjoy great wine and food, and appreciate the wonderful people who make it all possible, we encourage you to make plans now to attend next year’s Barrels in the Plaza event. 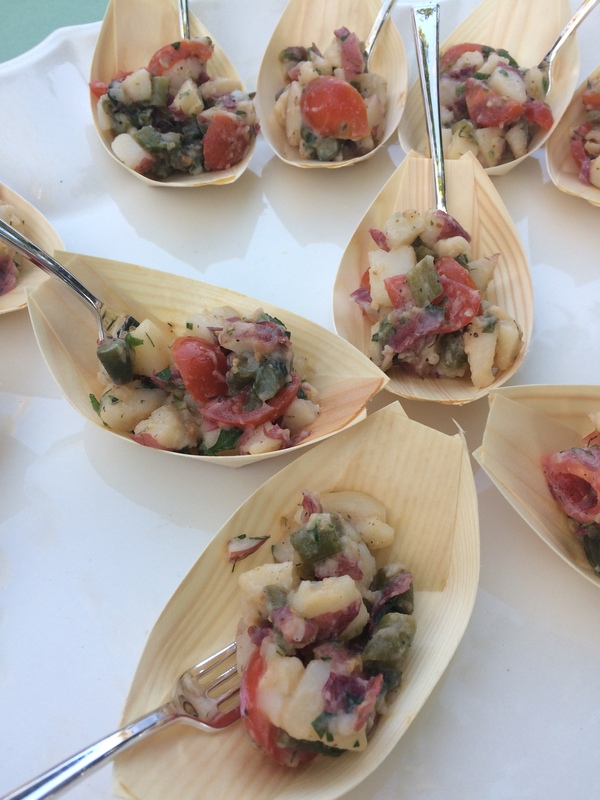 It’s a great way to support and celebrate the amazing food and wine culture we have right here on the Central Coast. While the 27th annual Barrels in the Plaza is now in the record books, the second part of Roll Out the Barrels is peeking around the corner. Tomorrow is the first day of the 4×2 Passport: providing passholders the opportunity to visit their choice of four different wineries on Friday and Saturday, for a total of eight. In this case 4×2 = many more great experiences to look forward to. What did you think of this year’s Barrels in the Plaza? We heard it wasn’t as crowded as past years, which made for a more enjoyable evening. If you’ve been to prior events, what did you think? How about all the wineries—and did you find a new favorite? And the food! Wow. 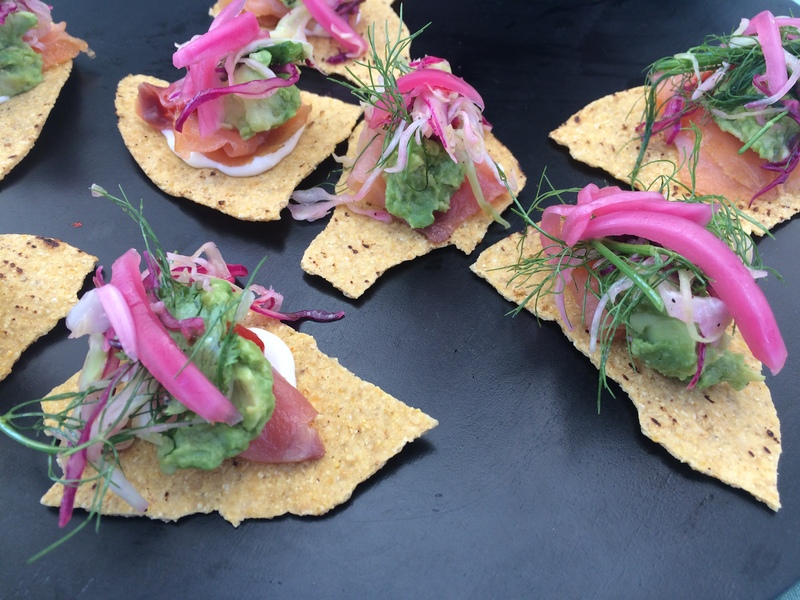 Did the small plates entice you to try a new restaurant? Please share what you thought, either by leaving a comment below or emailing us at engage@gr8flavors.com. And let us know what you’d like to see covered next time. 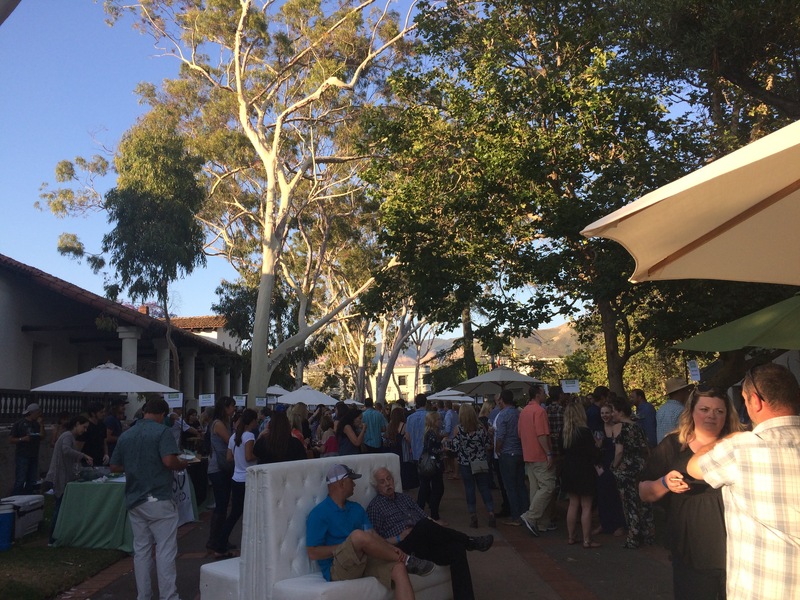 Barrels in the Plaza brings wine, education, food, and fun to SLO Wine Country.